I started exploring belonging last year, during a five-week residency at the Sanitary Tortilla Factory in Albuquerque, New Mexico. That project resulted in a 13 handlettered signs and a ’zine. Learn more. 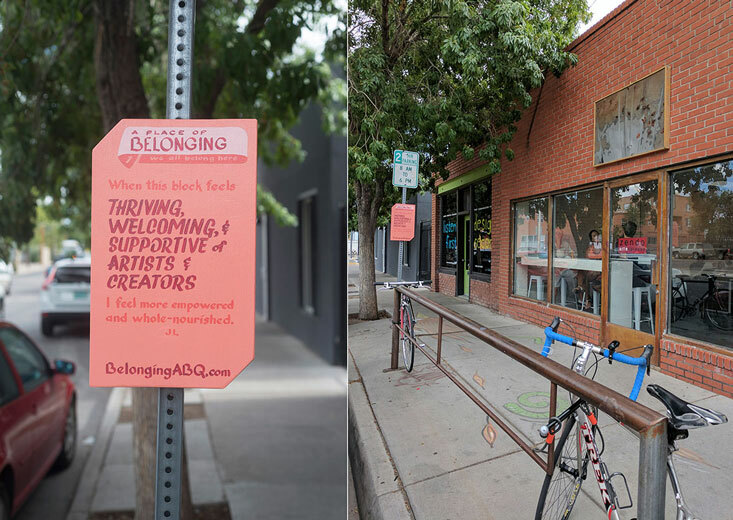 Two examples of hand-painted signs commemorating places of belonging in Albuquerque, NM in a 2017 project. 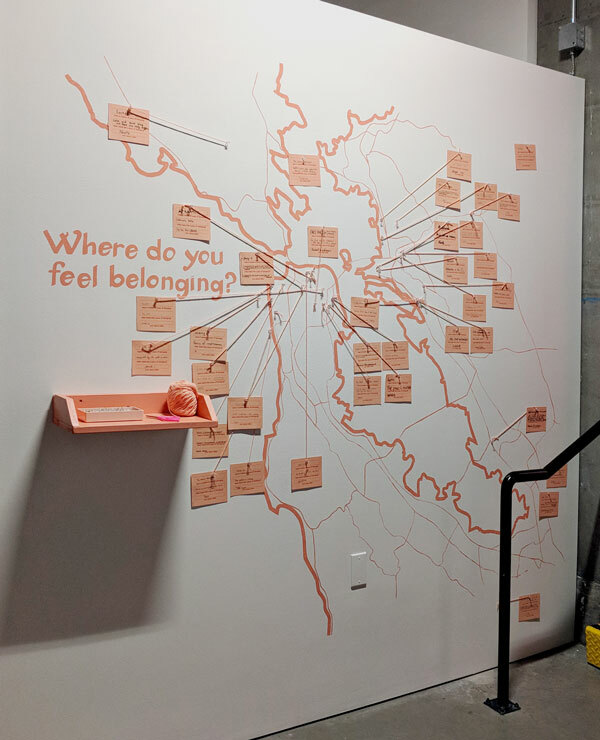 I also created a project to explore belonging in the Bay Area in Take Action, an exhibition at the California College of the Arts in San Francisco. Some of the stories collected there made their way into 100 Stories of Belonging in the S.F. Bay Area. Participants added their place of belonging to a map of the Bay Area (seen here on opening night). I’m originally from the Bay Area, and have lived in the North Bay, Penninsula, and East Bay before relocating to Queens in 2010. I’ve returned regularly for family, friends, residencies, and exhibitions. I conducted writing workshops at San Francisco Art Institute, Soccer without Borders at Castlemont High School in Oakland, and the Union City Library (with a Chinese interpreter and support from Chinese Culture Center). I also presented at a Brown Bag Lunch at the UC Berkeley Public Service Center. I partnered with community organizations—NIAD in Richmond and The Beat Within in juvenile halls in six Bay Area counties—to collect stories from program participants. I worked with volunteers from Santa Clara University and San José State University. Volunteers conducted interviews with their family members. I invited the public to contribute via an open call available in English, Spanish, and Chinese. At Kala Art Institute, I printed, hand-lettered, and framed certificates and I screen-printed bandanas. I installed certificates at places of belonging. I also edited and designed the book. I presented the project and released the book at the Othering and Belonging Conference in Oakland. Is Belonging a Place or Something You Carry With You? On Galería de la Raza as not a building, but a movement; on SF’s outflow of people moving away; and on SF becoming like NYC and vice versa. What is the Bay Area? Understanding the area and population of the nine-county Bay Area. Germination. Reviewing the seeds I’d planted for this project; plus an incomplete list of people I want to thank. Points of Reference on Othering and Justice. Links to two stories about lives of immigrants that remind me of why belonging is so important.